A Program (i.e. Computer Program) is a Sequence of instructions, written to perform a Specified task with Computer. Task of developing programs is called Programming. The Person who is engaged in Programming Activity is known as Programmer. We can also say that Programmer is a person who writes Computer Software. C is a general-purpose programming language developed by Dennis Ritchie for the Unix Operating System in 1972 at Bell Laboratories. C is successor of B language which was introduced around 1970. C is also Known as Middle level Language because it combines the best elements of low level or Machine language with high level language. C Language has the ability to communicate directly with hardware makes it powerful Choice for System Programmers for writing system programs like Compiler and Interpreters. Today C is most widely used System Programming language. UNIX and Linux Operating System are written using C Language. Why you should Learn C? C is simple and Easy to Learn. C is structured programming language. C can compiled on variety of computers and programs written in C runs faster as Compared to other programming language. 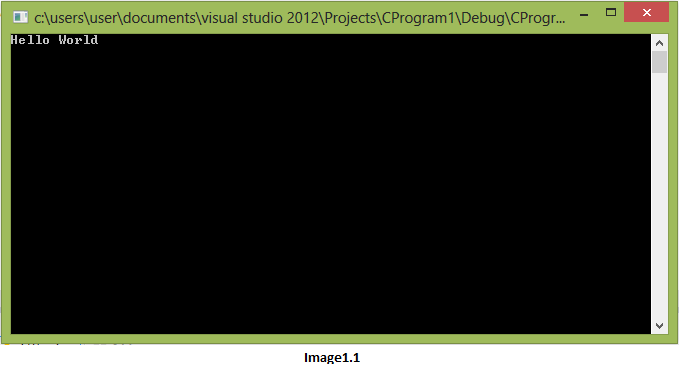 C programs are written into text files with extension “.c”. Example helloworld.c. After creating a program using C language, if you want to run your program then you need a compiler. Compiler converts your program into a language understandable by a computer i.e. Machine language (binary format).If you don’t have Compiler than you have to download it. Without Compiler you are not able to run your C Program. Compiler vendors provides several Integrated Development Environment (IDE) which contain Editor as well as Compiler. There are several IDE available in the market targeting different Operating System. For Example:-Turbo C++, Borland C++, Microsoft C++ etc. #include is directive to C preprocessor known as Compiler Directive. Lines starting with # are processed by the preprocessor before the program is compiled by the Compiler. As we know that C is Small Language and it can do almost nothing without including the External Libraries. So, we have to tell the compiler what external code we want to use by including header files. In above example we have used two header files i.e. “stdio.h” and “conio.h”. The stdio library (standard input/output header) contains the code that allow us to read and write data from and to the terminal (Console). Every program starts Executing from the main function. C Program can contain one or more function out of which one must be main. When printf statement executed, It prints Hello World message to the terminal. C is a Case sensitive Language. Always terminate the statement using semi-colon. When printf statement executed, all the characters inside double quotes printed exactly same as the written in the code till it encounter the backslash. On encountering the backslash (“\”) in the string, it combines backslash with the next character and form an Escape Sequence. In Example 1.2 it form “\n” which means new line. When “\n” comes, the cursor moves to the next line and starts writing the characters from next line.